Petition closed: forward to 20mph in Glasgow?! The GoBike petition for 20mph in Glasgow closed earlier with 214 signatures. Many thanks to all of you who signed and/or encouraged others to sign. Heart FM, interviews and news bulletins this morning. An excellent campaign, WELL DONE EVERYONE! 20mph in Glasgow: 4 days left to sign the petition! Click on “View and create petitions” to go to the next page. 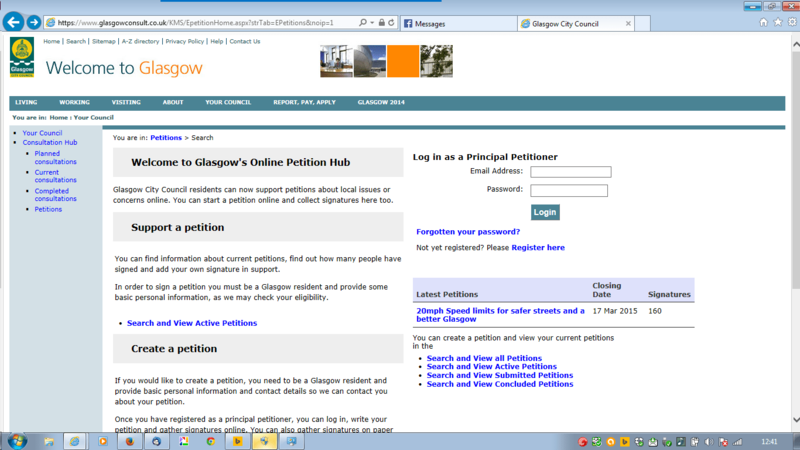 Click on the petition descriptor, in the centre of the right-hand for the petition signing screen. Fill in your details, click submit – and wait for the e-mail back. REPLY TO THE E-MAIL! This confirms your signature and adds you to the list of signatories. Please ask your friends, family and colleagues to sign as well. If we can get the go-ahead for 20mph in Glasgow, the largest city in Scotland, it should be relatively easy to get this progressive measure approved in other parts of the Strathclyde area that GoBike covers. IF YOU HAVE ALREADY SIGNED (or think you have), PLEASE CHECK THAT YOUR NAME IS SHOWN; there have been one or two glitches. Don’t forget the GoBike Public Meeting, Wednesday 11 March, 7 for 7:30pm in the Admiral Bar, Waterloo Street, Glasgow, with Phil Noble from City of Edinburgh Council talking about the introduction of a 20mph speed limit there and Carlyn Fraser from Clackmannanshire Council explaining how roads there have been calmed to encourage active travel. 20mph – 8 days left to sign the Petition! 20mph for Glasgow: Herald blog, and please sign the petition! 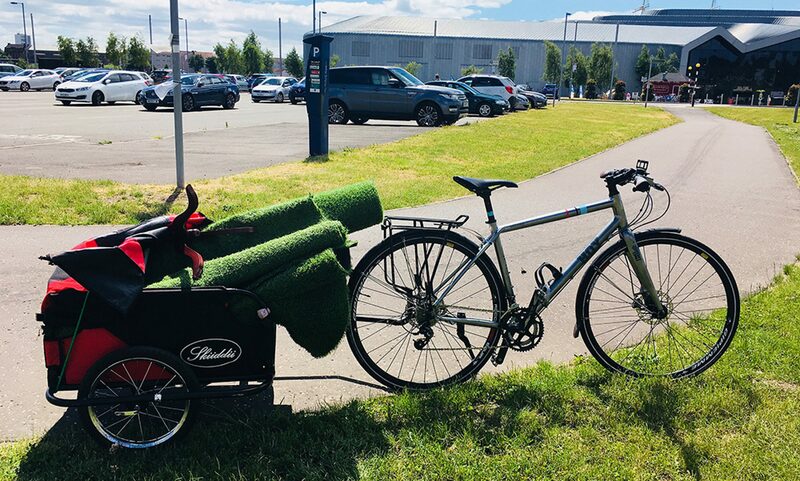 Read Bob Downie’s views on 20mph in Susan Swarbrick’s blog – and convince yourself, and others, that this is the way to go for our towns and cities. Now please sign the petition at: https://www.glasgowconsult.co.uk/KMS/epetitions.aspx if you haven’t done so already, and please encourage your friends, family and colleagues to do likewise – although it’s Glasgow residents only.